Manhattan. The Museum of Modern Art. I’ve come to look at one of their Cézannes. From across the gallery, I can just make out the object of my quest, his "Still-Life with Compotier." Taking care not to look at it directly, I maneuver myself in front of the painting, stand still, and close my eyes. I wait for as long as I can, but even ten seconds feels excruciating. I open my eyes and absorb the work. 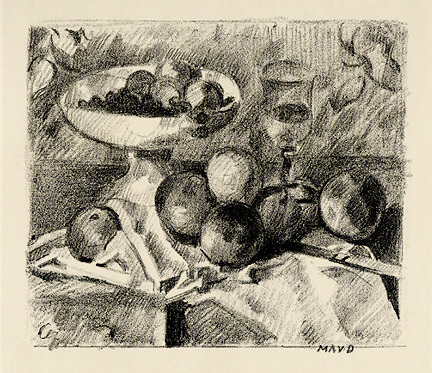 Inventory of things observed: foliated wallpaper, a table with a drawer, a folded napkin or tablecloth, six apples, a wine glass containing some liquid, an ivory or bone handled table knife, and a compotier containing four more items of fruit and a bunch of grapes, three of which overhang the side of the dish. To the bottom left of the canvas, a partial signature. I’ve waited two decades to see the work. 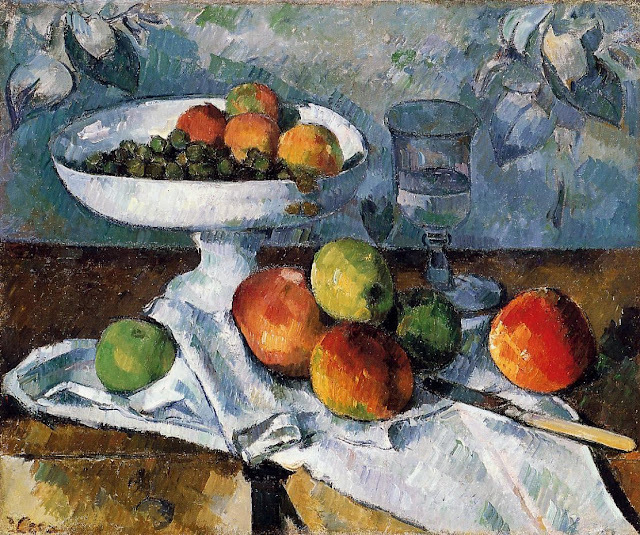 Back in 1993-4, as an undergraduate, I spent an entire academic year studying just one artist: Paul Cézanne. Taught by Richard Verdi, an authority on the artist, the course was an absurd luxury and it changed my life. I was still just a student taking an art history “option”—my official subjects were English and History—but now I wanted to devote all my looking and thinking to art. I was, I suppose, a fledgling art historian. 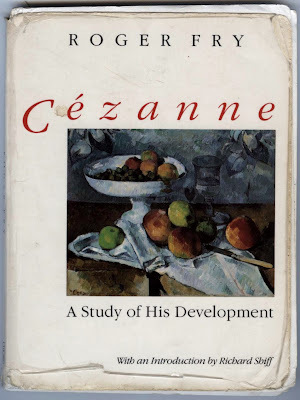 The class visited the Cézannes in London and Paris but, as much as the paintings, it was a book about Cézanne that really sparked my interest: Roger Fry’s Cézanne. A Study of His Development (1927). Despite the age of the book, there was something fresh and compelling about Fry’s prose and about his commitment to Cézanne, including his insistence that you had to see the originals. No substitute would do. 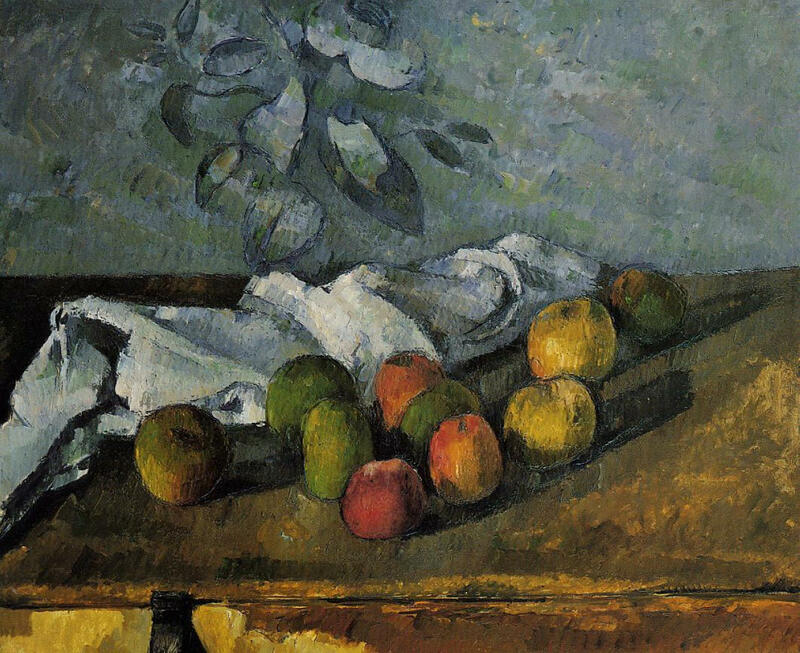 The jacket of the first edition was monochromatic and sported Fry’s own lithograph “after” a Cézanne original; but I was reading a much later edition that had a colour reproduction of the Still-Life with Compotier on its cover. Fair enough: Fry’s discussion of the work takes up a good chunk of the short book. [T]here is one passage in this otherwise consummate design of which the meaning escapes me. I cannot see the necessity of the shadow cast by a half-opened drawer in the kitchen table. This vertical shadow troubles me. It seems to check the horizontal and slightly diagonal movements of the napkin-folds and to lessen their suavity. It is precisely because otherwise this composition seems to be of so rare a perfection and so rigorous an exactitude that it disturbs me always to feel a temptation to cover this part of the canvas with an indiscreet finger. It is an experiment that the reader can easily try on the reproduction, and at least settle the point for himself. How could I resist following Fry’s suggestion? I was an obedient and keen twenty-one year old. I put up my index finger in front of the book’s reproduction, blocked out the offending part, and noticed that the rest of the work did seem to change. For better or worse, things had subtly shifted. With finger up, the objects inclined towards the horizontal; with finger down, they straightened up again. For me, when the switch wasn’t a finger, it was light. And I was stone-cold sober. 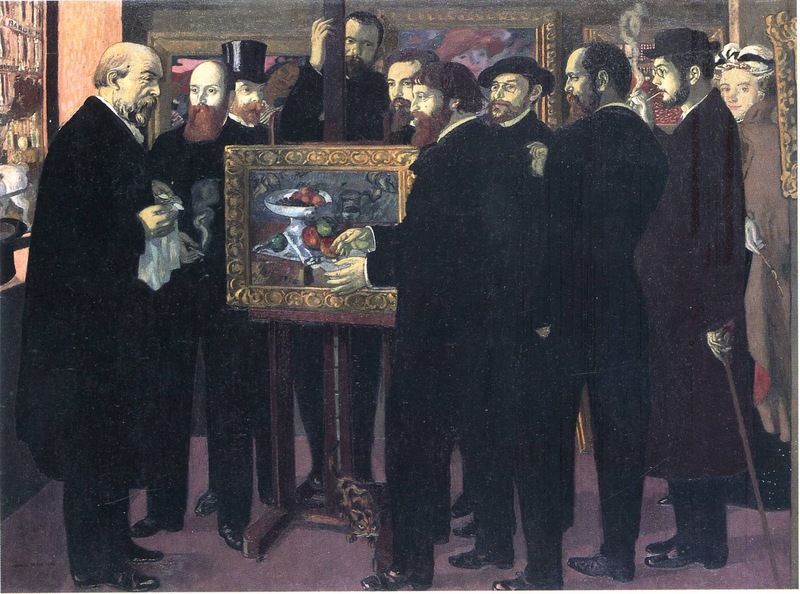 Looking at the Cézannes at the National Gallery, Washington D. C., I saw the colour planes in one of his paintings reformulate themselves before my eyes. Parts of the work would advance, while others receded, as though the composition were a living, breathing lung of colour. I soon realized that these perceptual shifts were happening in lockstep with the rapidly changing levels of natural light in the top-lit gallery. Outside, clouds were moving rapidly, now passing in front of the sun and then revealing it again; inside, my perceptions of the painting were in turmoil. As Fry was aware, the Still-Life with Compotier was already a bit of a legend when he came to write about it. 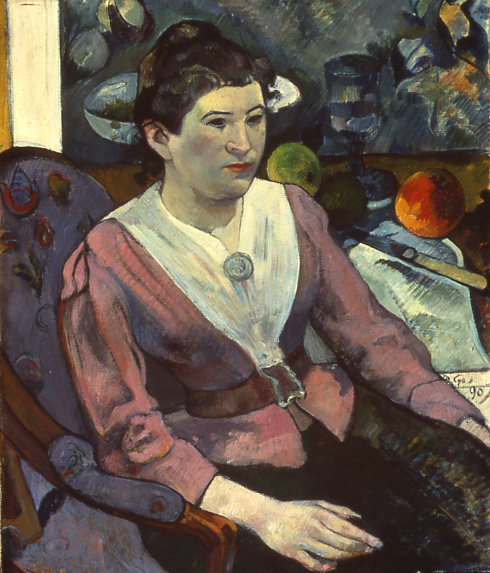 Painted in the late 1870s, the work was acquired by Paul Gauguin, who included it in his own Portrait of a Woman in Front of a Still-Life by Cézanne (1890). Like Ferris Bueller, I have hung out with Gauguin’s copy in the Chicago Institute of Art. 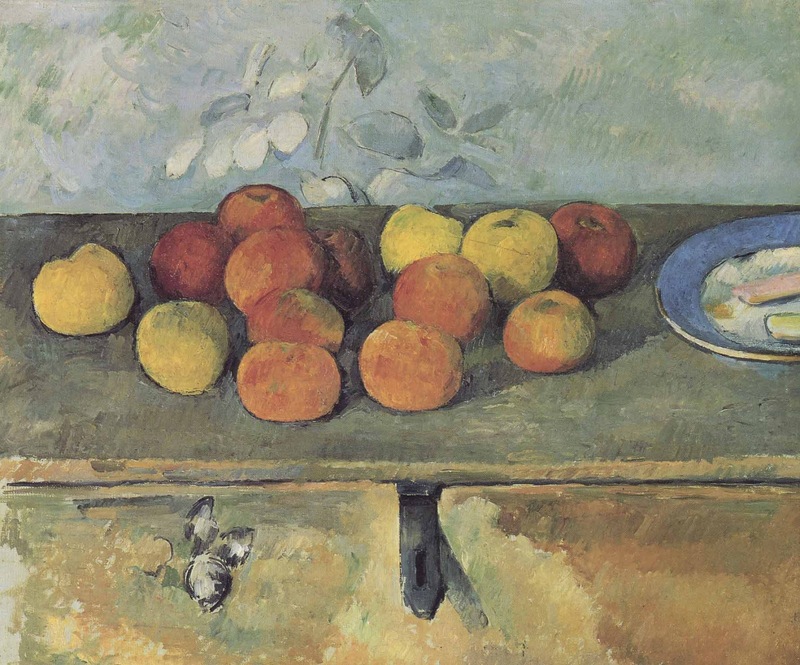 Gauguin gave a highly concentrated description of the painting in his book Avant et Apres (1903): “Impossible to describe.—Better yet, go see them [the Cézannes].—Ripe grapes overflow the edge of a compotier: on the linen apple-green apples and plum-red ones mix with one another.—The whites are blues and the blues are white.—A holy painter is this Cézanne.” Gauguin said he would never sell the work, but he did. The Still-Life with Compotier also stars in two works by Maurice Denis. It’s the source material for his lithographic copy and the focal point of his well-known Homage to Cézanne (1900). Denis’s world is not as compellingly weird as Cézanne’s and, in his print, he standardizes the compotier. The shape of the bowl becomes less distorted and more conventionally elliptical; having originally drifted to the left, the fruit dish is now “corrected” and recentred over its stem. As for me, my initial course on Cézanne led to an MPhil and then a PhD dissertation on Fry and Cézanne. My relationship to the Still-Life with Compotier turned professional. I read other people’s descriptions and analyses of it; I photographed it (with and without my finger added) and made prints and slides; later on, after the shift to digital, I scanned it and digitally projected it; I talked and wrote about the work. It was, I suppose, only a matter of time before I would blog about it. At some point, an obvious thought came to me. Why hadn’t I seen this painting “in the flesh,” to use a suggestively visceral phrase? And how can I really claim to know the painting without having seen the original? 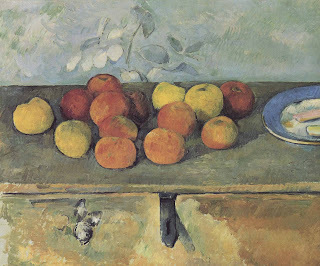 The work was not part of the large 1995-6 Cézanne retrospective, which I had seen at the Tate Gallery. In fact, I didn’t have a clear sense of exactly where the work was. Sometimes, I would see it as listed as being in the Museum of Modern Art, New York, but whenever I went there it wasn’t on display. 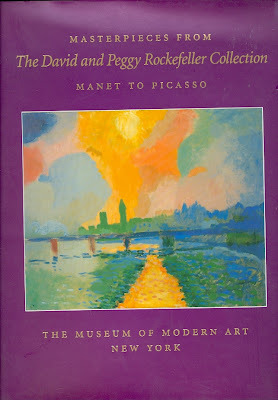 It was, I read on their website, a gift to the museum from David Rockefeller. In my jealous imagination, the painting hangs in some Rockefeller living room. The frame is no longer in the plain white frame we see in Gauguin’s painting, more like the gold one seen in Denis’s. And there they all are—those Rockefellers—reclining in their comfortable chairs, feet up, blazing fire in the background, sipping at glasses of expensive wine, and looking at “my” Cézanne! I went to MoMA anyway, and my contact there was unfailingly pleasant and professional. I was, she said, very welcome to look at the curatorial file they had on the Still-Life with Fruit Dish. (Yes, fruit dish. This is MoMA’s more accessible name for the work.) I consulted the slim folder. It included just a few legal documents and some excerpts from a MoMA exhibition catalog, Masterpieces from The David and Peggy Rockefeller Collection: Manet to Picasso. The exhibition was the last time the work had been public displayed. I noted the show’s dates: June 9-September 6, 1994. They overlapped, I realised, with the end of the course on Cézanne I had taken as an undergraduate. While I was opening up to Cézanne’s tantalizing fruit, MoMA was packing away the Still-Life with Compotier and shipping it back to its owner. Much has been written about the epiphanies and convulsions that can happen in front of art. (See: “Stendhal Syndrome.”) Sometimes NOT seeing a work of art, meaning not seeing the original work of art, can provide its own kind of inspiration. Almost all of the time I spend with art, I am not looking at originals. I am looking at photographs in a book or, more usually, at digitized images, projected on a screen or displayed on a monitor. There is something about the transition from reproductions to original, and back again, that fascinates me; there is even, I think, some perverse pleasure attached to not seeing certain originals. Perhaps it’s a way of sustaining my curiosity or protecting me against disappointment. What if—and we might call this the Mona Lisa phenomenon—the work doesn’t live up to my expectations? “It’s so small!” The dimensions of The Still-Life with Compotier are also diminutive: 46.4 x 54.6 cm. But the space the painting occupies in my imagination? Enormous. When I started out as an art historian, my desire was to know a work as thoroughly as possible, which meant treating it as a problem that needed to be solved or a riddle that begged to be cracked. Now I’m equally interested in how works of art resist and evade such attempts, even at the most basic level. What, for example, is even depicted in this still-life? Take Fry’s troublesome shadow. In naming this element, Fry changes the way we perceive not just that dark area, but the entire bottom-left corner of the painting. The shadow, he writes, is “cast by a half-opened drawer in the kitchen table.” But judging from other still-lifes the artist painted around the same time, I’m inclined to interpret this area differently. I see not a shadow but a hinged latch, which projects towards us and casts a diagonal shadow downwards. I want to put my hand on Fry’s “half-opened drawer” and push it shut. I revisit my initial inventory of things observed, improving it by putting my finger over one of the items: …a table with a drawer, a chest with a latch…. I have this shape that haunts my brain. I call it the Still Life with Compotier. One day I hope to see the painted version of this shape. (Manhattan. The Museum of Modern Art....) If I do, I will hold a finger up in front of the work and see if that changes it. I will wait around to see whether the painting seems to shift while I look at it. I will stay longer, hoping the light in the gallery might change. After a while, my eyes will tire. I will blink, look again, and then leave. The "Why Art History?" series has been a wonderful revelation! Thank you Dr. Harvey for this unique and very entertaining piece. I do hope you get to see the work in the flesh, finger and all! Thanks also to Hasan/3PP - I wonder what we'll have next in this exciting series?! Another enlightening post! What a wonderful platform you have created for us to share in the journey of not only great artists but also contemporary art historians as well. Thank you. Ben, thank you so much for taking us through your journey with this wonderful work or art. Cezanne is one of those artists I can't seem to find the words to describe but can only experience. You have described it all in such an eloquent, captivating fashion. Thank you and I hope you will unite with your beloved some time soon. Thank you for this powerful discussion of this -- holy -- painting. Congratulations on a wonderful, moving piece. I think there would be no harm in sending it to the Rockefeller Foundation and asking for a viewing. Fascinating, Ben. You fill in gaps in our knowledge of your BA year with Richard Verdi. Much to ponder on and a beautifully constructed & illustrated piece. More, please. Wonderful post, Ben! I completely understand what you mean about how "not" seeing a work of art can provide inspiration. So many art historians can relate to this topic. I have written a lot about sculpture, and I am fascinated with the transition from two-dimensional reproductions of sculpture to the three-dimensional form itself. Sometimes I am struck by the arguments I present to students about how the viewer can interact with three-dimensional sculpture, even though I have come to these conclusion through analyses of two-dimensional reproductions (having yet to see the original piece myself)! Hasan, thanks for continuing this great series! Thank you for the insights you provide....I will view art with a renewed sense of wonder. Personally....I enjoy viewing the drawer open...it adds a sense of movement that contradicts the perfect stillness. May your next valued observations be revealed soon....you are so gifted. Thanks everyone for your kind comments. I write this belatedly, months after the post was published, mainly as a way of paying tribute to Hasan, whose earlier death I heard about earlier today. Thanks for everything, Hasan, including the opportunity to contribute to 3 Pipe Problem. We miss you already.